Only a few blocks from the center of San Jose, in the heart of the Art District, "El Armario" known as "the cutest shop in Town", offers a unique selection of mexican folk art from every region of the country.Pottery, ceramic, candles, clay figurines, paper - Mache are just a few of the items on hand. During the 70s, the city´s first gas station was located here. 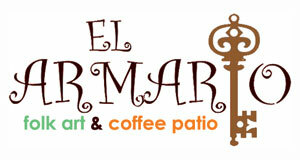 Now, in it´s place is a coffee patio that serves the finest blends from Veracruz. Please come and browse our selection and enjoy a taste of Mexico. On the corner of Morelos and Alvaro Obregon. Art District San Jose del Cabo, Los Cabos, Baja California Sur.